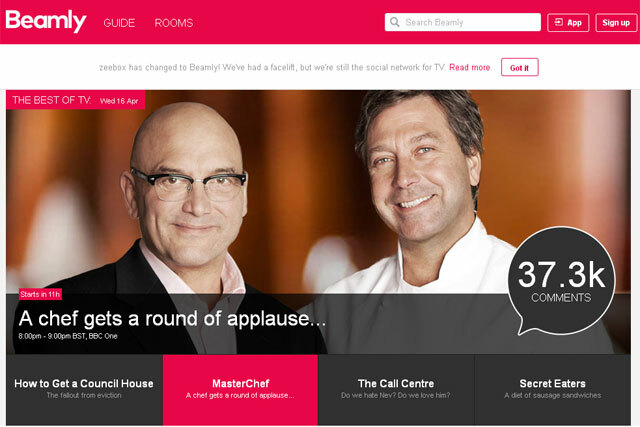 Zeebox, the second-screen TV app part-owned by BSkyB, has relaunched as Beamly in an attempt to become less tech-focused and more social. Available for iOS and Android, Beamly remains an app to accompany TV shows, but adds a few more discovery features and ways to engage with the shows that you like. Simon Miller, chief of product and content development at Beamly, said: "As our users asked us for more than just second-screen features, we began to evolve beyond second-screen experiences into what you might call a social network for TV, and our original name just didn’t match that evolution. We needed a new brand. "As a social network for TV, we wanted a friendly, all-inclusive name to brand a community of TV lovers whilst retaining our second-screen beginnings plus, of course, it needed to be memorable, distinctive and available. We considered hundreds of names, hunted high and low and eventually the name that put a smile on our faces (and everyone’s when you say it) was 'Beamly'." As well as BSkyB, other Beamly investors include NBCUniversal and Viacom, all of which will continue to promote their programming through the app. The redesign of Beamly is said to be a response to usage patterns – 65% of the app’s use is before and after the TV show, as opposed to when the TV show is actually on, and about 60% of the app’s audience is female and under 35, a demo more inclined toward social interactions. Jason Forbes, executive vice-president and US managing director, said the company’s focus on building TV communities of interest is the key difference. He said: "There are lots of other social platforms there. But we provide contextual relevance. If I say 'I can’t believe so-and-so just did that,' that doesn't mean anything to general Twitter followers. But it does mean something on Beamly." The new name is also designed to be notably less tech-centric. "People thought Zeebox was a German Xbox competitor," said Forbes. As part of the Beamly rebranding, 100 pop-culture "influencers" will host their own live "TV Rooms" – discussion areas on specific shows – in a bid to drive usage. They include social media and YouTube stars Tyler Oakley and Kalel Cullen. Zeebox enjoyed first-mover advantage when it launched in 2011 and quickly became the market-leading TV companion app, uniquely enabling consumers to discover TV content. The company, the brainchild of former EMI executive Ernesto Schmitt and BBC iPlayer architect, Anthony Rose, has around 140 employees worldwide, led from its office in Covent Garden, London.